Yay...We finally did it! A 10-day road trip along the California's 'Pacific Coast Highway' (PCH) - touted as one of the world's most spectacular drives by National Geographic - for our 3rd Anniversary. Before we began our journey on PCH, I was not sure what to expect of a road trip coz I have never been on one and my husband thought it is a demotion from our previous anniversary trips (1st one being a cruise to Bahamas and the 2nd one to Amazing Alaska). Despite our reservations, we had a great time and we both agreed that this was a perfect road trip for us, if there is one. On our 10-day road trip, we have been to fantastic beaches, amazing forests, cool blue lakes and have done activities like camping, kayaking, hiking all of which were wonderful but if I were to name one thing that made this trip truly wonderful - it would be this 'Mustang Convertible'. This made a good trip 'great' - Without doubt! We argued whether or not to rent it and had second thoughts about it, but it was the best decision we made in this trip. 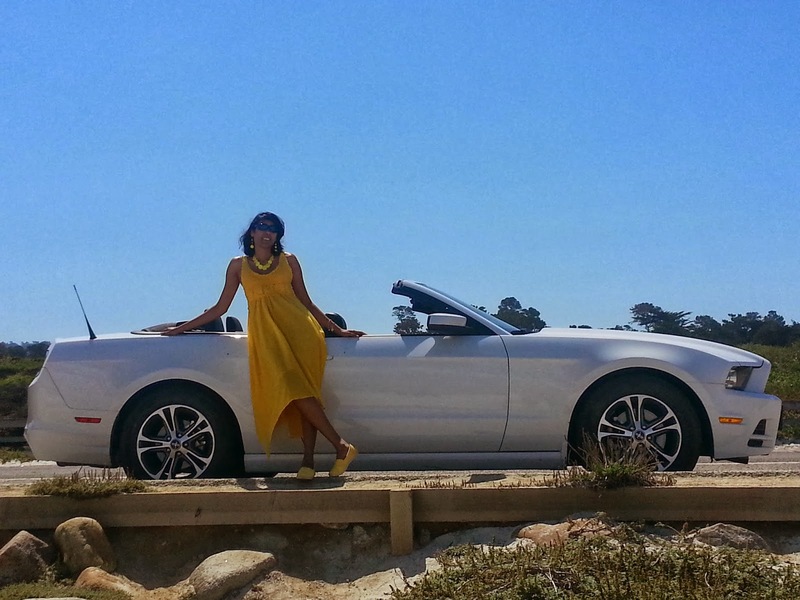 And if you are a couple planning a road trip along PCH without kids, DO RENT A CONVERTIBLE! Cut your costs elsewhere if you have to, by camping (instead of staying in hotels) and bringing your food along etc. And you will thank me for urging you to rent one! It may not work for you if you are traveling with kids or in groups, because the trunk space is small and may not fit all your luggage, food & drinks and camping equipment. Our Day 1 started in Los Angeles, where we reached the previous night from Phoenix. We took the California Highway 1 (PCH) and went through Malibu and Santa Barbara to reach Morro Bay which was our first stop in our trip. The reason being, I planned a surprise 'Kayaking with Dinner of the Dunes' activity in Morro Bay for my husband as it was his birthday that day. The first hour of our journey was excellent with the views of the coast on one hand and 'sun on the face, air in the hair' feeling of the open top convertible on the other hand. I must admit I enjoyed the convertible more at this point ;) The next couple of hours was not really on the coast though it was a nice road and nothing to complain about. Once we reached Morro Bay, we took the guided kayak tour where we kayaked in the lake for the first time (It wasn't tough coz the waters were still but was a good exercise for our arms) and reached the pristine sand dunes which are only accessible through boat. Once on the dunes, we had grilled dinner prepared by our guides served along with wine. So far so good. The best part, however, was kayaking back to the shore in the moonlight on serene waters. What a calm and peaceful experience it was! Moonlight Kayaking after dinner on sand dunes was great! We then went to 'Morro Strand State Beach' campground to do camping by the beach. The campground itself was crowded and its amenities were not great, but listen people, it is ON THE BEACH! After setting up our tent in the night, we went for a stroll on the beach. There is something 'magical' about walking on the beach in moonlight. It ranks very high on my list of 'most romantic things to do'. It counts even if you are walking alone! Just do it!! It was a perfect ending to Day 1. Guess what is on the other side of the bushes - BEACH! On Day 2, our plan was to just drive along the coast and check out all the cool places that dot the Californian coastline. And there are plenty. We however took a little detour to check out Hearst Castle but when we realized there is a two hour wait for a tour of the castle, we left. (If you want to take the tour, it is better to book in advance and be there on time. It wasn't on our priority list though we heard rave reviews about it). 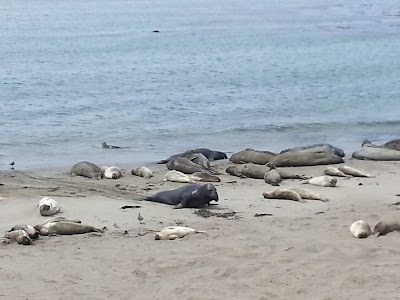 On the way to the castle, we saw several of these elephant seals lying idly on the beach. They were huge and lazy and the way they crawled, put sand on themselves and pushed other seals around made for a good show. It was so enjoyable that we had to push ourselves out of there to get back on the road. How much fun! This is one of my favorite parts of the world. My hubby would have LOVED driving that car!!! !